Every January 1st the Pope offers a message to encourage peace in our world. This year’s message focuses on religious freedom as a path to peace. In the message the Holy Father emphasizes the full dignity of the human person which much continually be maintained and safeguarded (a dignity which includes religious expression) while calling to task both secular regimes and politically oppressive regimes that subvert this basic freedom. Below is the full text. The Pope’s message is followed by the vocal stylings of Elvis Costello and friends singing, “Whats so funny about peace, love and understanding?”. 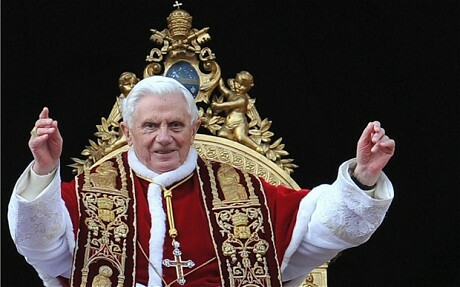 Earlier today, Pope Benedict offered the traditional “Urbi et Orbi” Christmas message and blessing. It is a wonderful reflection on love and is well worth the read. Below is the full text of the message. In the lowliness of the manger we see that “love and humility have more in common than love and majesty” (St. Bernard of Clairvaux). Merry Christmas everyone! The Christmas tree is up and decorated. The nativity scene is out. The Advent wreath is about to be put away. The Christmas cards that are going out this year have been sent. Gifts are wrapped. The stockings are hung (Bailey’s and Maxine’s already have doggie treats in them). What else is needed to make this a perfect Christmas? Oh, yes … a healthy dose of humility! 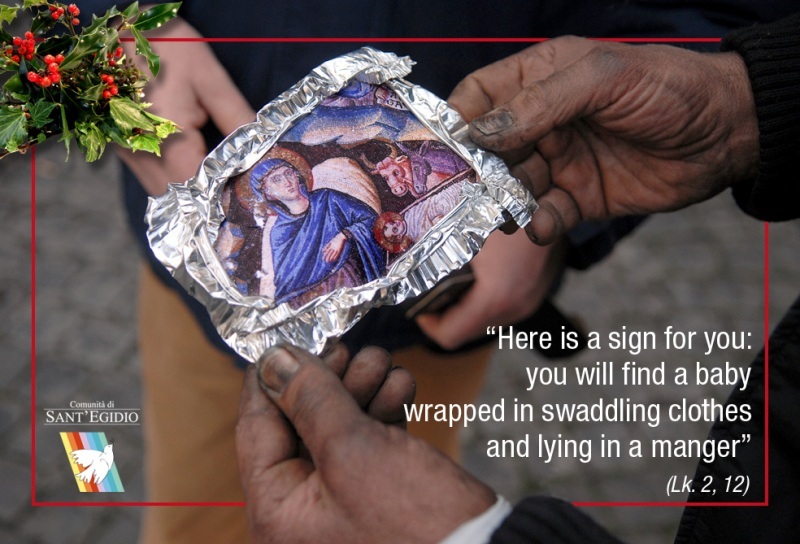 I began this season of Advent reflecting on the “sign” of the miners trapped underground in Chile and the three young men rescued from being lost at sea. I remain convinced that we are the miners and we are those who are lost. We cannot save ourselves. We stand in need of a savior. A common reflection for Christmas is the revelation of the humility of God. God humbles himself to be born a child. God does this for us and it is indeed good news! But there is another side to the equation of humility: if God has humbled himself to come to us then we, in turn, must humble ourselves in order to receive and welcome him. If the stable is good enough for God then it is good enough for us! We must make of our lives and our hearts a stable that is fit for the King of creation. This can only be done through humility. We must acknowledge who we indeed are and who we need. We are sinners and we stand in need of a savior. This acknowledgement does not deny our worth nor belittle the human spirit (as some “puffs of wind” in our world contend). Humility is the path to true dignity – a dignity founded not in the illusion of pride and self but in the reality of communion with God and communion with one another. God is completely at home in the humility and poverty of the stable – it is there that we find Him and that we discover the truth of who we ourselves are. O come, o come Emmanuel! Our world needs you. Our church needs you. I need you. And may we each make of our hearts a humble and poor stable worthy to receive and welcome you! Come Emmanuel and we shall rejoice! A further thought: God is indeed at home in the stables of our world – the poor, humble, lowly and put-away places of our world. If you are searching for God, if you are no longer comfortable with the void that this world offers – go (with a discerning and humble heart) to the stables of the world and there you will encounter God. An important note though – you must remain faithful. Once or twice is not enough, God wants to know that your heart is sincere. If you remain faithful in visiting the poor places, God will speak to your heart. In this age of conspiracy theories and cracking hidden codes I thought people might find this interesting. On each day from December 17-23, the antiphon proclaimed before the reciting of the Magnificat in the evening prayer of the Church’s Liturgy of the Hours refers to a different title for Christ. Each title is preceded by “O” – hence the designation “O Antiphons”. 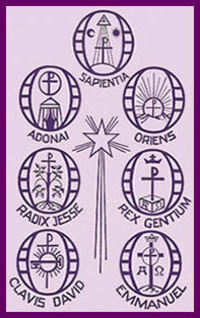 The antiphons help to focus the expectation of the waiting Church on the coming feast of the Birth of Christ while presenting an aspect of who the Messiah is. Each antiphon also refers to a specific prophecy by Isaiah regarding the coming Messiah. No one knows the exact origins of the “O Antiphons” – they are referred to by Boethius (c. 480-524) in his writings and by the eighth century they are in common use in the liturgical celebrations in Rome. Following this they become common throughout the universal church. December 17th – O Sapientia: “O Wisdom, O holy Word of God, you govern all creation with your strong yet tender care. Come and show your people the way to salvation.” Isaiah 11:2-3, 28:29. December 18th – O Adonai: “O sacred Lord of ancient Israel, who showed yourself to Moses in the burning bush, who gave him the holy law on Sinai mountain: come, stretch out your mighty hand to set us free.” Isaiah 11:4-5, 33:22. December 19th – O Radix Jesse: “O Flower of Jesse’s stem, you have been raised up as a sign for all peoples; kings stand silent in your presence; the nations bow down in worship before you. Come, let nothing keep you from coming to our aid.” Isaiah 11:1, 10 and Micah 5:1. December 20th – O Clavis David: “O Key of David, O royal Power of Israel controlling at your will the gate of heaven: come, break down the prison walls of death for those who dwell in darkness and the shadow of death; and lead your captive people into freedom.” Isaiah 9:6, 22:22. December 21st – O Oriens: “O Radiant Dawn, splendor of eternal light, sun of justice: come, shine on those who dwell in darkness and the shadow of death.” Isaiah 9:1. 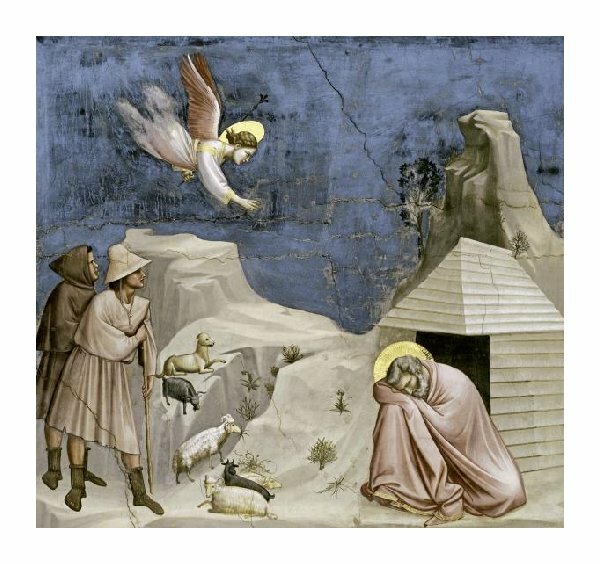 December 22nd – O Rex Gentium: “O King of all the nations, the only joy of every human heart; O Keystone of the mighty arch of man, come and save the creatures you fashioned from the dust.” Isaiah 2:4, 9:5. Now, some scholars point out that if you take the first letter of each title in Latin, starting from Dec. 23rd and working back to the 17th (Emmanuel, Rex, Oriens, Clavis, Radix, Adonai, Sapientia), you can form the Latin words “ero cras” which translates, “Tomorrow, I will come.” “Tomorrow” being the 24th and the beginning of the Church’s celebration of the birth of Christ. In all of the gospel story Joseph does not say one word yet his actions speak volumes. In fact, Joseph is not mentioned at all in the Gospels of Mark and John and just in passing in the Gospel of Luke. It is in Matthew’s gospel that we encounter this quiet saint. Four times in the first two chapters of Matthew’s Gospel, Joseph receives divine instruction in a dream. Each time he trusts and he obeys. On the surface one could easily call Joseph a fool and I am sure some did. He must have been ridiculed when it became known that he took Mary in even though she was already with child. But he trusted and it was this trust that enabled him to weather the storms of ridicule and difficulty that he had to endure following each divine instruction (taking Mary in, picking up everything and heading to Egypt, returning and finally being led to settle in Galilee). All of this begs the question, “What was it that enabled this depth of trust and certainty in Joseph?” There is one simple description of Joseph at the beginning of it all in Matthew’s gospel that points to the answer. After the revelation of Mary’s pregnancy, Matthew writes, “Joseph, her husband, since he was a righteous man, yet unwilling to expose her to shame, decided to divorce her quietly.” (Mt. 1:19) Joseph, simply put, was a good man. He did the right thing because it was the right thing to do. Here I would like to make a point about Joseph that I fear is being lost in our day. 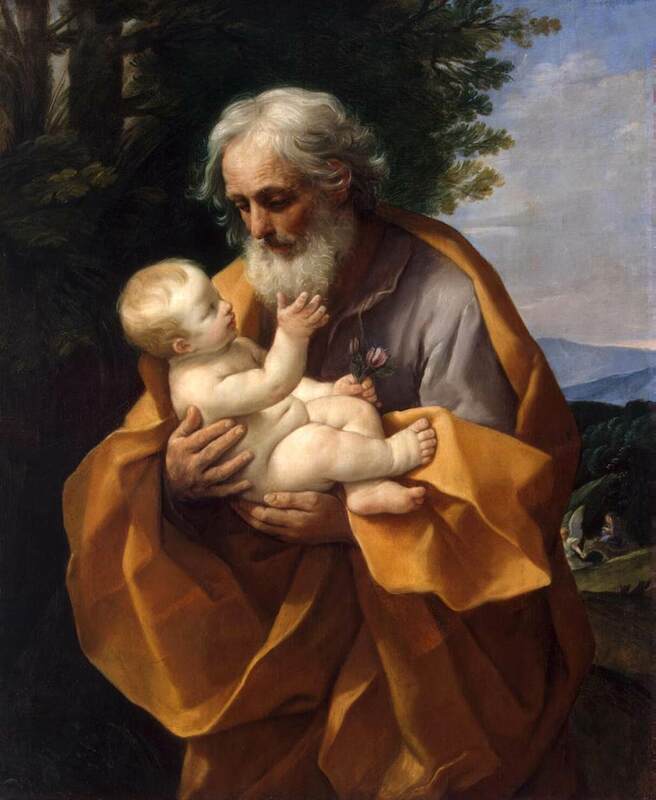 In iconography it has been the tradition to portray Joseph as an elderly man. In fact, it is a more recent adaptation that tends to portray him as a contemporary (age-wise) of Mary. This is important, I believe, because we live in a time that overvalues youth and devalues age. Might the need to portray Joseph as a young and robust man be a subtle form of age-ism? My question is this; would a younger man have had the wisdom and the life awareness needed for the depth of trust required to face what Joseph had to face? Matthew specifies that Joseph was a “righteous man” – my experience is that one does not just wake up one day “righteous” but that righteousness is gained through a long process of living in right relationship with God and neighbor. Righteousness takes time. In a world of Percy Jackson and the Lightning Thief and Harry Potter we like the idea of the young person waking up one day to an understanding of his or her uniqueness and wealth of powers and abilities (with very little mentoring and training involved – if any) yet how realistic is this? I don’t think it is very realistic in terms of righteousness and the moral life nor anything else for that matter. Somethings take time – developing skills, knowledge and ability takes time, being righteous before God and neighbor takes time. I have no problem picturing Joseph as older than Mary and in fact I think this portrayal of Joseph offers an important instruction for us regarding the journey of faith and discipleship and a needed corrective for our time. It was a common practice in their day for an older widower to take in a younger bride. With this understanding the siblings of Jesus referred to later in the gospel story can be seen as step-brothers and sisters. Children of a previous marriage of Joseph. Joseph – the quiet saint – has much to teach us if we just have the ears to listen. Since the 2003 invasion of Iraq by United States led forces the situation of the Christian community in that nation has become very dire. The Christian community in Iraq is one of the oldest in the Church and yet today the community is on the brink of being non-existent with many members fleeing the country in a search for safety. Although in no way connected with the invasion of their country, Christians in Iraq have become equated in the minds of Muslim extremists with the invaders and therefore have become the target of acts of violence and of prejudice. During this season when we await the coming of the Prince of Peace please remember our Christian brothers and sisters in Iraq and their beautiful and ancient community. Please pray for peace among all peoples in that land and that any form of violence in the name of God cease and be recognized as a sin offensive to God, the Creator of all peoples. 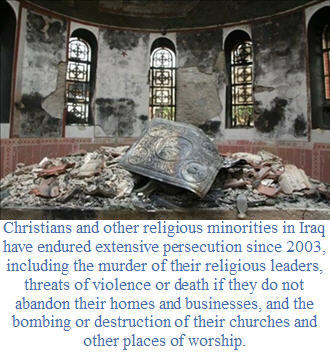 Below are two articles related to the situation of the Christian community in Iraq. The first is written by Barbara Surk of the Associated Press (Nov. 2, 2010) and it tells the story of the devastating terrorist attack against Christians during Mass at Our Lady of Salvation Catholic Church. The attack left 58 persons dead and 78 wounded. The second article is from Zenit.com and it tells of an initiative to work to protect all religious minorities in Iraq. Iraq’s dwindling Christian community was grieving and afraid yesterday after militants seized a Baghdad church during evening Mass, held the congregation hostage, and triggered a raid by Iraqi security forces. The bloodbath left at least 58 people dead and 78 wounded — nearly everyone inside. The attack, claimed by an organization linked to Al Qaeda, was the deadliest ever recorded against Iraq’s Christians, whose numbers have plummeted since the 2003 US-led invasion as the community has fled to other countries. Pope Benedict XVI denounced the assault as “ferocious’’ and called for renewed international efforts to broker peace in the region. Islamic militants have systematically attacked Christians in Iraq since the collapse of Saddam Hussein’s regime, effectively chasing more than 1 million people out of the country, according to estimates from an adviser to Iraq’s top Catholic prelate, Chaldean Cardinal Emmanuel III Delly. In an interview, the cardinal encouraged the country’s remaining 1.5 million Christians not to be driven off by the militants. Sunday’s carnage began at dusk, when a deadly car bomb went off in the area. Militants wearing suicide vests and armed with grenades then attacked the Iraqi stock exchange, injuring two guards. The attacks may have been an attempt by the militants to divert attention from their real target — the nearby church in an upscale Baghdad neighborhood. The assault on the church soon followed. The gunmen went inside the structure and took about 120 worshippers hostage. The dead included 12 police officers and five bystanders thought to have been killed by the blasts outside the church before the attackers stormed inside. Forty-one Christians inside the church also died, including two priests. Iraqi officials had initially provided a much lower death toll. A statement posted late Sunday on a militant website, allegedly by the Islamic State of Iraq, appeared to claim responsibility for the attack. The group, which is linked to Al Qaeda in Iraq, said it would “exterminate Iraqi Christians’’ if Muslim women in Egypt were not freed. One parishioner, Rauf Naamat, said militants began by throwing several grenades and spraying the crowd inside the church with gunfire. After the initial violence and chaos died down, the militants walked up to the priest celebrating the Mass, told him to lie down, and shot him, he said. An Iraqi official said he had a phone conversation with a militant, who demanded that authorities release all Al Qaeda-linked prisoners starting with the women. The official said he judged by the militant’s accent and speech that he was not Iraqi. When Iraqi special forces joined police and other officials already on the scene, they heard gunshots and decided to enter the church “to prevent the further loss of innocent lives,’’ said Lieutenant Colonel Terry L. Conder, a spokesman for US special forces. WASHINGTON, D.C., DEC. 14, 2010 (Zenit.org).- The U.S. federal government Commission on International Religious Freedom is urging a redoubling of efforts to protect Iraqi Christians, and requesting that the U.N. Security Council be used as a forum to address the situation of Christians and other minorities in Iraq. Leading up to Wednesday’s U.N. Security Council meeting regarding Iraq, the U.S. Commission on International Religious Freedom (USCIRF) released a statement today. The USCIRF recommended three steps to aid Iraqi Christians and other minorities. They requested a periodic update for Congress on the progress of this process.